When you’re out walking through huge amounts of snow, you want to keep your feet steady and eliminate all possibility of sinking. 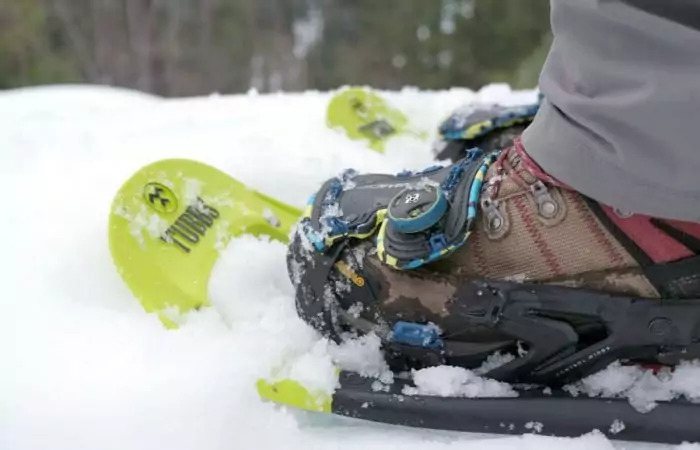 If efficiency and comfort are top priorities for your winter hikes and treks, we’ve reviewed some of the best snowshoes for beginners. There are a lot of factors to take into account, so don’t make a rash decision. These products and their main specs are summarized in the table below but read the more detailed description for extra information regarding their features. Look for a sturdy frame, that’s made from metal or aluminum. Of course, metal is the heaviest and there are different types of aluminum too. The 7000 series is better, lighter and more resistant than the 6000 series, and some brands even patent the alloy and process of frame manufacturing. The shape of the frame is important too because that relates to grip, efficiency, and comfort. So look for a V-shape that doesn’t put a lot of strain on your feet. 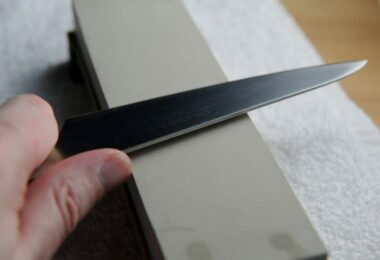 Most decks are made from plastic, and some from steel, and just like the frame, there are different sorts of processes and materials made from plastic. These account for weight and resistance, but you need decks that can offer maximum floatation. See our piece on the best snowshoes to help you walk on snow. Also, look for lightweight decks – mostly made from plastic, not steel – and a smooth shape, so you don’t have to put a lot of effort walking. Both the heel and toe crampons have to provide great grip. The heel ones should be made from steel, and account for stability when you’re walking downhill, while the toe crampons should provide security when climbing. The crampons have to offer you stability and the more rotation they can withstand, the better. So flexibility is definitely a significant factor here, as well as resistance. This tells you how much weight your shoes support. You’ll see that different sizes overlap when it comes to the recommended capacity, so it’s better to choose a size that will put you in the middle range. That’s because you need to take the weight of your equipment into account too. That means your weight can vary quite a bit from one trip to the other, which is why it’s better to choose a versatile pair of snowshoes. The weight of your snowshoes impacts how comfortable you’ll feel. Beginners sometimes have to make a compromise between shoe weight and stability: the heavier the materials used, the more stability the snowshoe offers. So while it may be difficult to control a heavier shoe, it can also be difficult if you loose your balance. 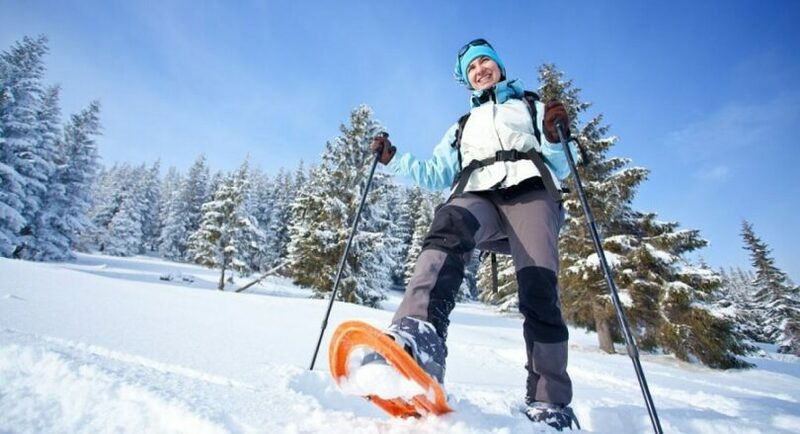 Basically, think what terrain you’ll be using the snowshoes on a flatter ground requires less help with balance as opposed to an inclined terrain. So you can make shoe weight a priority on easy or moderate terrains, but stability is definitely more important on slopes. The following products are some of the best on the market. Each has different characteristics, and we’ve tried to make our selection as diverse as possible to cover all tastes and purposes. 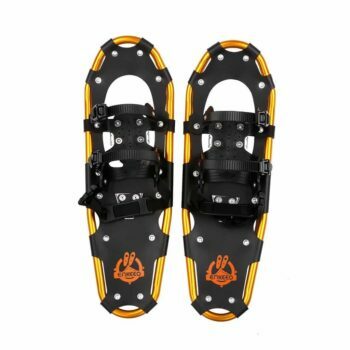 These 4.2 stars Tubbs Mountaineer Snowshoes are great for mountaineering purposes. The first thing we love about them is that it’s not awkward walking with them at all because they have a Pro-Step frame that guarantees amazing floatation. This frame is made from a sustained frame bend along with a rise that’s also longer and lower. Plus, you get the SoftTec decking that adds to resistance and floatation, also being lightweight and smooth. These shoes have a lateral flex great to protect you from impacts thanks to their shock-absorbing design. That will help you conserve energy, as well as keep your foot steady no matter the conditions, including downhill or on a slope. An amazing feature of the ActiveFit+™ is its different design according to gender. That, along with a patented Control Wings™ will give you more control and balance when walking through mountains of snow. You’ll also be getting a lot of support because these shoes are ergonomic, which makes for a comfortable wear and easy use. We love the toe crampon too because it’s manufactured from a great material: carbon steel. That makes it resistant to impacts and very sharp thanks to its eight teeth. 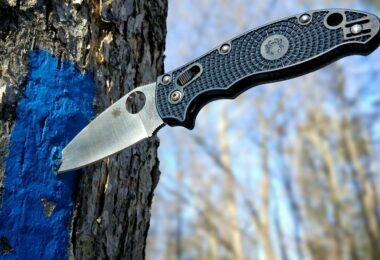 So you’ll always have a steady grip and awesome penetration, regardless of the terrain you’re walking on. 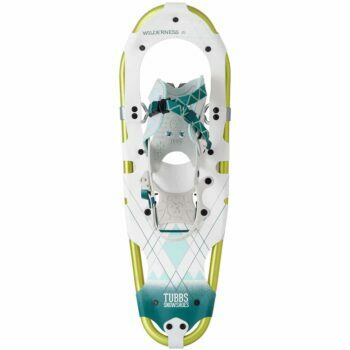 RELATED: Tubbs retails this item in a newer model: Tubbs Snowshoes Wayfinder Snowshoe. This has a lower price, its colors are lively and modern, and we love both the integrated heel strap and the binding design. 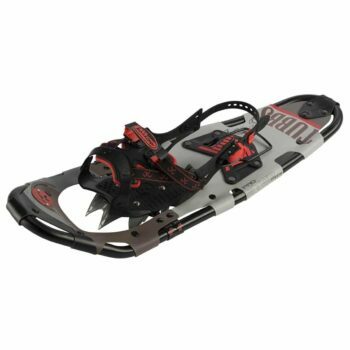 This 4.4 stars MSR Evo 22 Snowshoe is really appreciated by most consumers because it provides unparalleled traction. Weighing 3.6 pounds, this model is more than three times heavier than the previous pair we’ve discussed, but it has some additional advantages. For one, it has steel traction rails for increased security. The brake bars are inserted inside the actual decks, so you’re bound to have a good grip. The sense of security that comes with this shoe is also courtesy of its DuoFit bindings. These are great because they don’t let your feet freeze, apart from being glove-friendly. That means you can wear different sorts of shoes and it’ll still be comfortable and safe. And the size range is really impressive too, varying from a 4.5 M to a 15 M, while the colors you can purchase them in are Dark, Mineral, and Red. You have the option of acquiring separately the modular flotation tails. These come in handy when you need a good handling on extreme terrain while wearing smaller shoes. 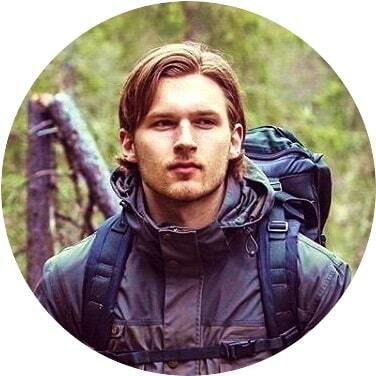 That accounts for extra-adaptability in different weather and terrain conditions, guaranteeing you a supported weight of 250 pounds. Without these tails, the snowshoes support 180 pounds, and they’re perfect for rolling terrain. 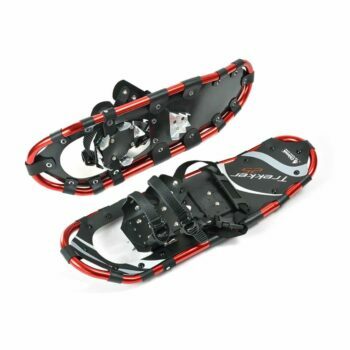 These 4 stars Alps All Terrian Snowshoes vary in price depending on the size you choose. The smaller models that reach 21/22 inches are perfect for a smaller weight between 90 to 140 pounds, the medium sizes of 25 – 27 inches go for a bodyweight between 125-175 pounds, and the bigger models of 27-30 inches are appropriate for people who weigh 150-225 pounds. Remember that this total weight includes your equipment too. 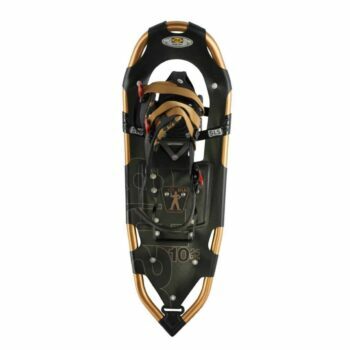 However, note that the official specs for this item state this snowshoes are specifically designed for people with a smaller build, as well as for kids and teens. If that’s you, you’ll be getting a sturdy shoe, with a frame manufactured from a 6061 Easton aluminum. That will give you all the support you need, along with the TPU-85 plastic Nytex decks. This is a resistant material too, not to mention lightweight so it doesn’t unnecessarily add to the weight of your snowshoes. The bindings offer a perfect cradling of your shoes because they’re molded around a male boot. That also means they offer increased padding to both the arch and the ball of your foot for extra comfort, eliminating pressure points. We like the lacing system too because it has Fast-Loc buckles. That way, your feet are well secured, and you can easily put on or take off the actual shoes. The downsides include the fact that they’re a bit noisy, as well as somewhat difficult to fit. But they get the job done, and that’s what matters. 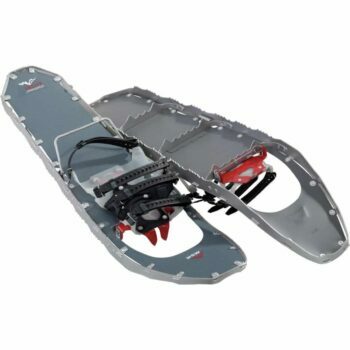 These 4.4 stars silver MSR Lightning Ascent Snowshoes vary in price according to the size you’ll get. The smaller is 22 inches and can be found both in a women’s and in a men’s model, and they both supports up to 180 pounds. The 25 inches option weighs a bit over 3 pounds too and can support a load of 120 – 220 lbs, while the bigger 30 inches model can only be found in a men’s model. This weighs a bit more than 4 pounds and can support a 150 – 280 lbs load. 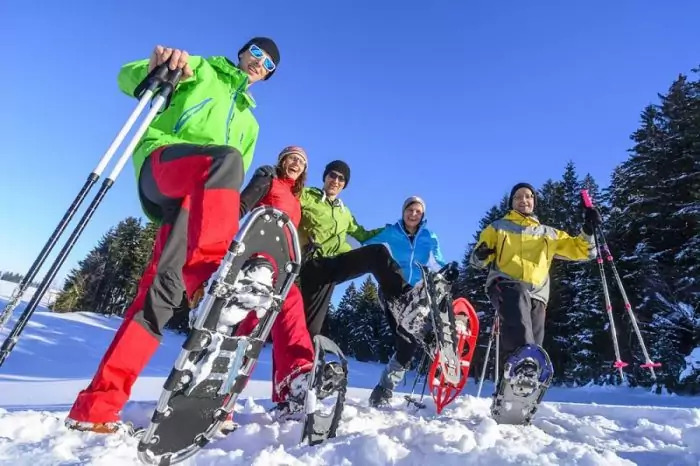 All these snowshoes can be worn with different sized shoes, ranging between 4.5 M – 15 M for men and 4.5 W – 14 W, and they all have sturdy frames that offer a 360-degree traction. These frames provide an overall grip, from one edge to the other so you’re perfectly supported and secure. The disadvantage is that the edges can stick and lock into each other, so you can fall down unexpectedly. The Torsion 2 crampons have split teeth, for added grip and constant contact. The AT are two-piece and independently conforming, and they’re freeze-resistant too. However, they unclip easily and are pretty floppy. 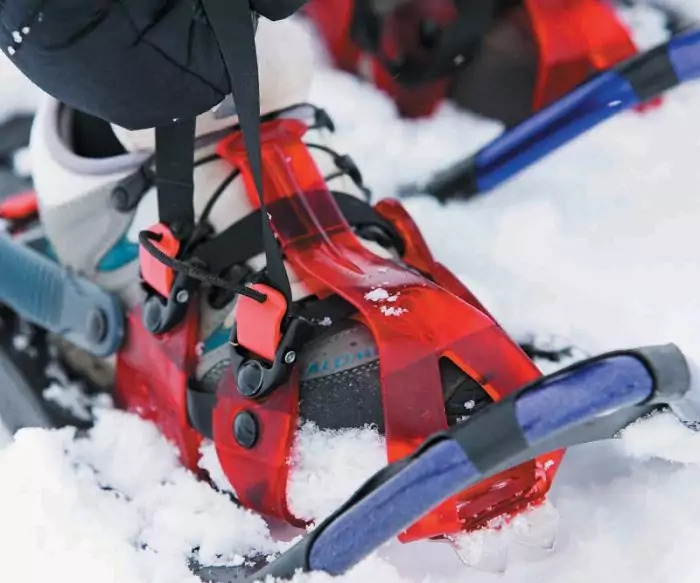 For extra security and comfort, you can wear the modular floatation tails that offer increased control and maneuverability if you’re wearing smaller snowshoes. The Ergo Televators add extra traction too, so they make for more efficient and less cumbersome wear. That way, you’ll be less tired when walking on inclined terrain, particularly because of their ergonomic build. 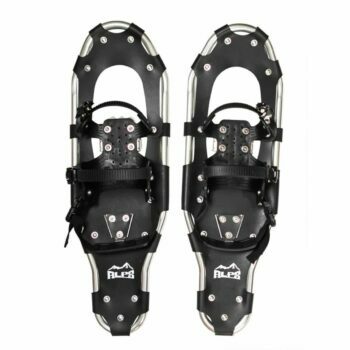 These 4.6 stars Atlas 1025 Snowshoes are unisex and their 32 inches length can support a weight of over 200 pounds, which is great for both men and women. They have an ergonomic design thanks to their suspensions that are spring loaded, which means your feet can move in a natural manner so they don’t become a tiresome wear. The bindings are great too, considering they’re New Wrapp Swift for a comfortable wear and an added support of your foot arch. They also have a one-pull uniloop construction, which is meant to fit different sorts of shoes, even if they come in one size. This design accounts for increased performance and an efficient walk too. The V-shape frame means you won’t put in a lot of extra effort when navigating through deep snow, as it will help keep your feet on the surface. Plus it’s made from sturdy proprietary Atlas and Elektra 6000 series aluminum. The climbing bar used won’t put any unwanted pressure on your calves either, while the decks made from strong Nytex will help you walk for hours at a time. We love the All-Trac toe crampon too because it’s made from tempered steel and that’s really strong and helps you get a good rip. The Traverse Trac rails contribute to this maximum control too, especially when walking downhill. Plus, they contribute to the comfortable feel of this snowshoe, along with the positive toe locator and the EVA padding that’s quite insulating. The straps are comfortable too, not to mention easy to put on and take off, but they might unclip on you because of that. The heel doesn’t stay too centered either when walking downhill, which means you might end up with a lot of snow in your boots. These 5 stars Louis Garneau – HG Massif Snowshoes are retailed for a different price according to size. You can pick three measurements: 825, 930 and 1036, all with a modern Black/ Blue color, that can support a maximum weight of respectively 200, 250 and 300 pounds. With weights ranging from 4.4 to 5.5 pounds according to size, these aren’t the lightest pair of mountaineering shoes we’ve reviewed so far, but they’re still great for beginners. One reason is that they’re sturdy enough to give you a good grip and stability when you’re walking through snow. 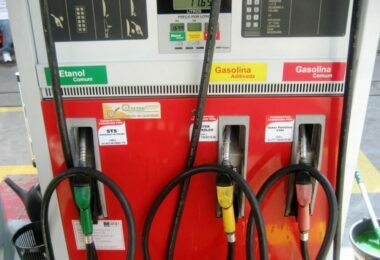 Another reason is that they have a user-friendly design, with proven ergonomics. That means you’ll get a natural stride, and the surface you’re stepping on is optimized so that the snow shedding ability is pretty great. 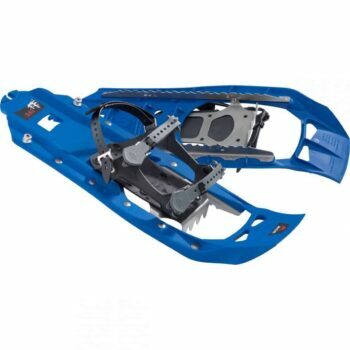 Unlike the above products, these particular snowshoes are manufactured from a mix of synthetic and mesh. That accounts for good insulation and breathability, but it’s not a material as strong as plastic or aluminum for instance. You’ll still be getting a winterproof shoe with a lifetime warranty in case something goes wrong. But chances are nothing won’t thanks to the Traxx+ crampons that are made from carbon steel for increased traction on various terrains. The fixed pivot will keep your foot stable, and the contact harness system has great support, apart from being really comfy thanks to the EVA padding. The fastening system is beginner-friendly too, because it offers a resistant fastening, with great lateral traction. Not to mention it’s easy to tie. 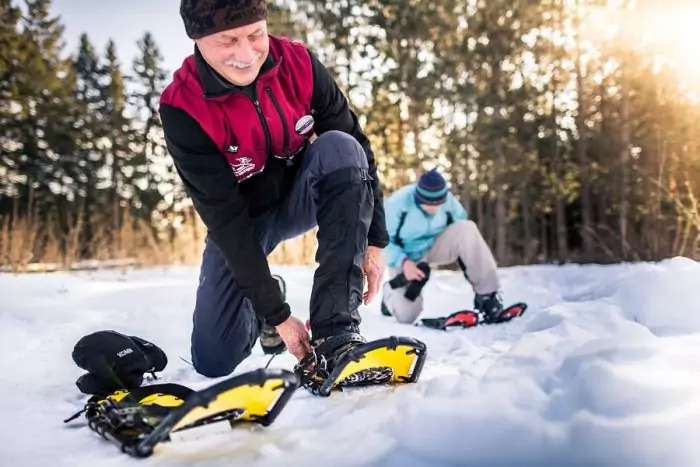 Plus, because of the materials used, you’ll be getting a pair of flexible shoes that can resist to temperatures as low as -40° C.
These 4.5 stars Chinook Trekker Snowshoes have a lower retail price than most of the above models, which put them in the lower part of the price spectrum. Again, this price varies along with the five sizes you can choose: 19, 22, 25, 30, and 36. However, the price is reflected in the maximum recommended load: these shoes may be cheaper, but they only support 59 to 90 pounds. The materials used, as well as their upper load limit, render these shoes in the middleweight range, at just 3.91 pounds. So they’re pretty lightweight, though not as light as the Tubbs snowshoes. As such, the frame is aluminum made, which is pretty strong and has an ergonomic build that helps you walk both efficiently and comfortably, without straining your feet. The decking is made from polyethylene, which is another robust material. But this is also UV resistant, which is definitely a perk because snow reflects sun rays. The crampons are aluminum too, a heavy duty sort of aluminum in fact, so they’re sturdy enough. When it comes to traction, comfort, and grip, these crampons play a significant role. They can rotate freely for maximum grip, and they offer enough support when you’re going downhill. Everything else is quite comfortable too: the bindings are dual ratchet, freeze-resistant and quite easy to use even with gloves, while the heel straps have buckles for quick donning and doffing. The best thing is that these snowshoes come with an included carry bag with backpack straps to carry it on the outside of your pack, side handles, great ventilation thanks to a mesh manufacturing, as well as Velcro pole carriers. The limited lifetime warranty is another perk, guaranteeing you they’ll work to temperatures as low as -40° C.
RELATED: Get a pair of amazing trekking poles to help you navigate on difficult terrains. The CMT 1 Pair Trail Poles are great because they absorb impact to your feet caused by rolling terrain, so they work great with these snowshoes. 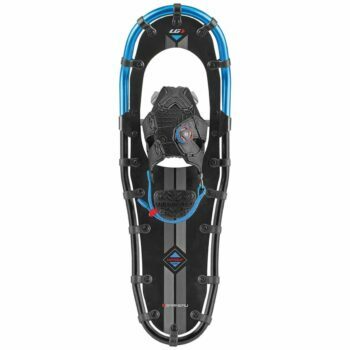 These 4.5 stars Enkeeo Terrain Snowshoes are priced in the lower range too, depending on the three sizes you can get: 21, 25 or 30 inches. Each supports a maximum capacity of 120 /160 /210 lbs and they have a fashionable black/ orange pattern. These aren’t just nice looking though, they’re great for beginners courtesy of their streamlined design. Just as some other products reviewed before, they have a rounded tail that’s a bit upturned to make your walking efficient and easy at the same time. The reason why these are great for beginners is that their frame is made from metal, which accounts for increased stability. The PE deck also contributes to this, accounting for extra flotation. This fastening system is pretty popular with all the models we’ve seen so far. 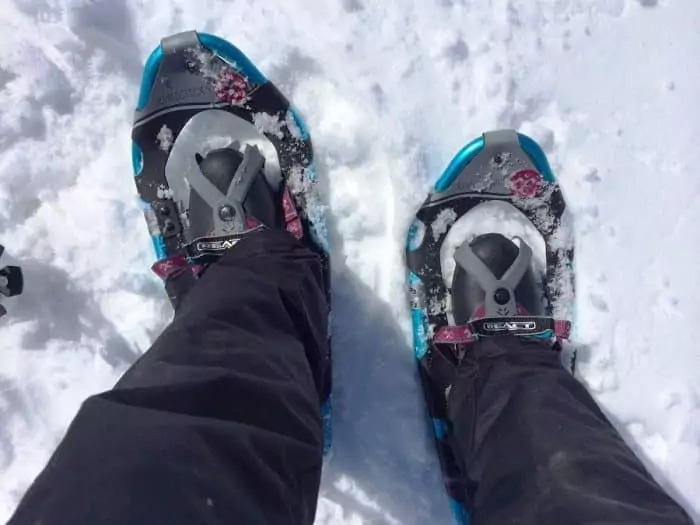 The crampons will give you all the traction you need because they’re aluminum-made, just like the more expensive products in this article. The bindings are double ratcheting, as you can see with other models, so they can fit the majority of shoes and shoe sizes. They’ll keep your feet in place, so you’re not straining during your treks. The feet are also supported thanks to the single buckle fastening system, as well as the TPE heel strap. The downside of these shoes is that they aren’t the lightest on the market, with the smaller size weighing a bit over 5 pounds and the bigger one almost 7 pounds. But the materials used are tough and sturdy, plus the price is really convenient. Therefore, they’re not amazing portability-wise, though the included carry bag saves a little face. RELATED: Get these Enkeeo Trekking Poles for extra security and comfort when you’re walking downhill. They’re easily adjustable and very light, as well as anti-shock, so they complement the characteristics of the Enkeeo snowshoes really well. These 4.5 stars Tubbs Wilderness Snowshoes are more expensive than the previously reviewed model, but they’re not breaking the bank. You can choose four sizes: 21, 25, 30 and 36 inches, each for a minimalistic Black/ Grey color pattern. At almost 8 pounds, these snowshoes are definitely the heaviest from our list, but they’re still great for beginners thanks to a sturdy frame. This is manufactured from a 6000-series aluminum, just like the first Tubbs item we’ve discussed, so it has the same characteristics: strength, durability, and ability to release snow build up. The technology used for its manufacturing is the patented Tubbs Fit-Step which guarantees an ability to absorbs shock 10 times as much as other similar products. The bindings help you walk more efficiently and comfortably too because they’re the 180 Pro model. That means they keep the front of your feet secure without suffocating them, as well as your heels. The toe crampons are carbon-steel made, just as many other products above, so they offer increased grip on both ice and snow. The heel crampons are amazing too when it comes to walking downhill. Hopefully, after reading all these reviews, your decision is easier. For instance, you can get the Tubbs Men’s Mountaineer Snowshoe that’s the lightest or the Louis Garneau that supports the most weight. Or you can choose between the Chinook Trekker Snowshoes for moderate terrains and the Tubbs Snowshoes Wilderness for the more difficult terrains and conditions. In the end, it’s all up to you, so let us know what you decide and why. The comments are right below. If you want a worthwhile project that can save you money, check out our instructions on easy DIY snowshoes for more options.